This is a cute, fun romance with a slightly annoying protagonist. Quinn is flawed and can be mean, but I rooted for her anyway. I've not bought a lot of romance for my library lately (the section is already pretty big), but I'm adding this one. Give this to middle school girls who love Sarah Strohmeyer, Jennifer E. Smith, and Holly Smale. SUMMARY: When they were eleven years old, Wesley James said something that changed Quinn Hardwick's life forever. Sure, he didn't realize what he did wrong, but that doesn't change the fact that Wesley irreparably hurt Quinn's family. Now, five years later, Wesley James has moved back to town and--worse--has started working at the restaurant where Quinn works. Quinn wants revenge, and it starts with getting perfect Wesley fired. REVIEW: Okay, yes, Quinn got on my nerves with her ill-conceived (and just plain mean) idea to get Wesley fired. Yes, she's unreasonably obsessed with this idea that Wesley James ruined her entire life. But did I love this book anyway? You bet! Truly, Quinn isn't the most likeable character, but I forgave her revengey-ness with Wesley because she's so real. She does do some mean things to sabotage Wesley, but she does at least feel bad about her actions. It doesn't really make it right to do those things, but she's still a likeable, complex character overall. I loved Quinn's struggles with her father's gambling addiction and her obsession with going to England. I loved her conflicting emotions about visiting her beloved grandmother in the nursing home since she's been diagnosed with Alzheimer's. I loved how she works in a restaurant themed on the English Tudor period. I love how the actor playing Henry VIII gets his kicks by putting employees into the stocks. Wesley James Ruined My Life has a lot of heart. It's more than just a teen romance; there's real life behind the Wesley James plot. The romance is cute and completely obvious from the first day Wesley and Quinn meet again after five years of Quinn's hating Wesley. It's clear Wesley liked Quinn then and that he still likes her now. This book will be popular with readers who love a sweet romance with a dose of real-life problems. At only 256 pages, it's short enough to entice some reluctant readers as well. The story is easy to get-into; I zipped through it in one sitting. Even though the characters are about to be high school seniors, I would be okay giving this book to middle school readers craving romance. There's only two kissing scenes, and both are pretty tame. The ending is cute in a Say Anything kind of way. 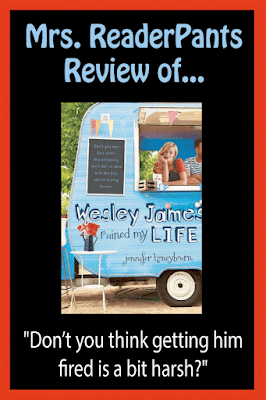 THE BOTTOM LINE: Wesley James Ruined My Life is a cute romance that will find lots of fans. Give this to readers who love Anna and the French Kiss, Dumplin', and Smart Girls Get What They Want. STATUS IN MY LIBRARY: I plan to order this book. I am judicious with buying more romance titles because our Romance section is so large right now, but I know this book will find some fans. I can already think of some middle school girls I will give this to. Hi, Lauren! "Cute and summery" sums the book and the cover up perfectly. I love that the content is okay for middle school. Haha! At one time, my criteria for historical fiction was that it had to be set before I was born (1975) to be "historical." Yeah, not so much now. My cut-off for historical fiction these days is more like 1995. Sigh.